Author’s note: In the wake of the November 13th terrorist attacks, the French Space Agency CNES canceled the celebration of the 50th anniversary of the launch of Asterix. This post commemorates the launch of France’s first satellite 50 years ago this week, and pays a small tribute to the noblest of human endeavors, namely the exploration of space and the pioneering spirit of humanity exemplified by a heroic nation. A milestone in space flight occurred 50 years ago tomorrow, when France became the sixth nation—behind the U.S.S.R., the United States, Canada, the United Kingdom and Italy—to field a satellite. The A1 mission, renamed Asterix after a popular cartoon character, launched from a remote desert base in Algeria a few hours after dawn at 9:52 UT on November 26th. Though France was 6th nation in space, it was 3rd—following the Soviet Union and the United States—to launch a satellite atop its very own rocket: the three stage Diamant-A. The launch of Asterix into the blue desert skies over Algeria. The satellite launch was intended mainly to test the ability of the French-built rocket, which flew 11 more times before its retirement in 1975. Asterix did carry a signal transmitter, and was due to carry out ionospheric measurements during its short battery-powered life span. With a high elliptical orbit, Asterix won’t reenter the Earth’s atmosphere for several centuries to come. The tense control room during the launch of Asterix. The French space program started in 1961 under president Charles de Gaulle and centered around the construction and use of the Diamant rocket. Three variants were built, including the one used to place Asterix in orbit. One of the stranger tales of the early space age involved the first—and thus far only—sub-orbital launch of a cat into space from the same Algerian site in 1963, though Iran recently made a vague statement that it would do the same in 2013. An aerial shot of Hammaguir Air Base in Algeria from the early 1960s. Contact with Asterix was lost due to a damaged satellite antenna shortly after launch. Founded in 1961, the French space agency CNES (The Centre National d’Etudes Spatiales, or National Centre for Space Studies) now partners with NASA and the European Space Agency on missions including micro-gravity studies on the International Space Station, Rosetta’s historic exploration of comet 67P Churyumov-Gerasimenko and more. And although the Hammaguir space facility in Algeria is no longer in use, CNES operates out of the Kourou Space Center in French Guiana and the Toulouse Space Center in southern France today. A stamp series commemorating the Diamant rocket and Asterix. Though inoperative, Asterix still orbits the Earth once every 107 minutes in an elliptical low Earth orbit. Asterix ranges from a perigee of 523 kilometers to an apogee of 1,697 kilometers. In an orbit inclined 34 degrees relative to the Earth’s equator, Asterix isn’t expected to reenter for several centuries. A 42 kilogram satellite approximately a meter across, Asterix is visible worldwide from about 40 degrees north to 40 degrees south latitude. Essentially a binocular object, you can nonetheless see Asterix from your backyard if you know exactly where and when to look for it in the sky. Asterix will appear brightest on a perigee pass directly overhead. Asterix’s NORAD ID satellite catalog number is 01778/COSPAR ID 1965-096A. When it comes to hunting for binocular satellites, you need to now exactly where it’ll be in the sky at what time. We use Heavens-Above to discern exactly when a given satellite will pass a bright star, then simply watch at the appointed time with binoculars. We also run WWV radio in the background for a precise audio time hack. This allows us to keep our eyes continuously on the sky. This simple method is similar to that used by Project Moonwatch volunteers to track and record satellites starting in the late 1950s. The evolution of the Diamant rocket. Other satellite challenges from the early Space Age include Alouette-1 (Canada’s first satellite), Prospero (UK’s first and only indigenous satellite) and the oldest of them all, the first three Vanguard satellites launched by the United States. Don’t miss a chance to see this living relic of the early space age, still in orbit. Happy 50th to the CNES space agency: may your spirit of space exploration continue to soar and inspire us all. NASA’s ‘Journey to Mars’ is ramping up significantly with ‘InSight’ – as the agency’s next Red Planet lander has now been assembled into its flight configuration and begun a comprehensive series of rigorous and critical environmental stress tests that will pave the path to launch in 2016 on a mission to unlock the riddles of the Martian core. The countdown clock is ticking relentlessly and in less than nine months time, NASA’s InSight Mars lander is slated to blastoff in March 2016. InSight, which stands for Interior Exploration Using Seismic Investigations, Geodesy and Heat Transport, is a stationary lander. It will join NASA’s surface science exploration fleet currently comprising of the Curiosity and Opportunity missions which by contrast are mobile rovers. But before it will even be allowed to get to the launch pad, the Red Planet explorer must first prove its mettle and show that it can operate in and survive the harsh and unforgiving rigors of the space environment via a battery of prelaunch tests. That’s an absolute requirement in order for it to successfully carry out its unprecedented mission to investigate Mars deep interior structure. InSight’s purpose is to elucidate the nature of the Martian core, measure heat flow and sense for “Marsquakes.” These completely new research findings will radically advance our understanding of the early history of all rocky planets, including Earth and could reveal how they formed and evolved. “Today, our robotic scientific explorers are paving the way, making great progress on the journey to Mars,” said Jim Green, director of NASA’s Planetary Science Division at the agency’s headquarters in Washington, in a statement. The launch window for InSight opens on March 4 and runs through March 30, 2016. InSight will launch atop a United Launch Alliance (ULA) Atlas V rocket from Vandenberg Air Force Base, California. InSight counts as NASA’s first ever interplanetary mission to launch from California. The car sized probe will touch down near the Martian equator about six months later in the fall of 2016. 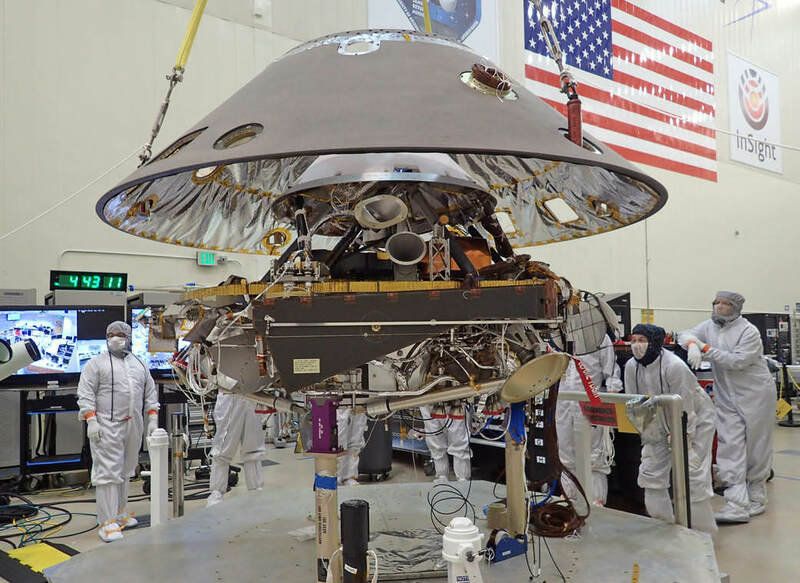 The prime contractor for InSight is Lockheed Martin Space Systems in Denver, Co and the engineering and technical team recently finished assembling the lander into its final configuration. So now the time has begun to start the shakedown that literally involve “shaking and baking and zapping” the spacecraft to prove its ready and able to meet the March 2016 launch deadline. “The assembly of InSight went very well and now it’s time to see how it performs,” said Stu Spath, InSight program manager at Lockheed Martin Space Systems, Denver, in a statement. After the vacuum test, InSight will be subjected to a series of tests simulating the vibrations of launch, separation and deployment shock, as well as checking for electronic interference between different parts of the spacecraft and compatibility testing. The $425 million InSight mission is expected to operate for about two years on the Martian surface. InSight is an international science mission and a near duplicate of NASA’s successful Phoenix Mars landing spacecraft, Bruce Banerdt, InSight Principal Investigator of NASA’s Jet Propulsion Laboratory (JPL), Pasadena, California, told Universe Today. “InSight is essentially built from scratch, but nearly build-to-print from the Phoenix design,” Banerdt, of NASA’s Jet Propulsion Laboratory (JPL) in Pasadena , Calif, told me. The team can keep costs down by re-using the blueprints pioneered by Phoenix instead of creating an entirely new spacecraft. It is funded by NASA’s Discovery Program as well as several European national space agency’s and countries. Germany and France are providing InSight’s two main science instruments; HP3 and SEIS through the Deutsches Zentrum für Luft- und Raumfahrt. or German Aerospace Center (DLR) and the Centre National d’Etudes Spatiales (CNES). SEIS and HP3 are stationed on the lander deck. They will each be picked up and deployed by a robotic arm similar to that flown on Phoenix with some modifications. “The race is on” to find a safe and scientifically interesting landing site for the Philae lander piggybacked on ESA’s Rosetta spacecraft as it swoops in ever closer to the heavily cratered Comet 67P/Churyumov-Gerasimenko since arriving two weeks ago after a decade long chase of 6.4 billion kilometers (4 Billion miles). Rosetta made history by becoming the first ever probe from Earth to orbit a comet upon arrival on Aug. 6, 2014. “It’s just astonishing,” he said during a live ESA webcast of the Aug. 6 arrival event. 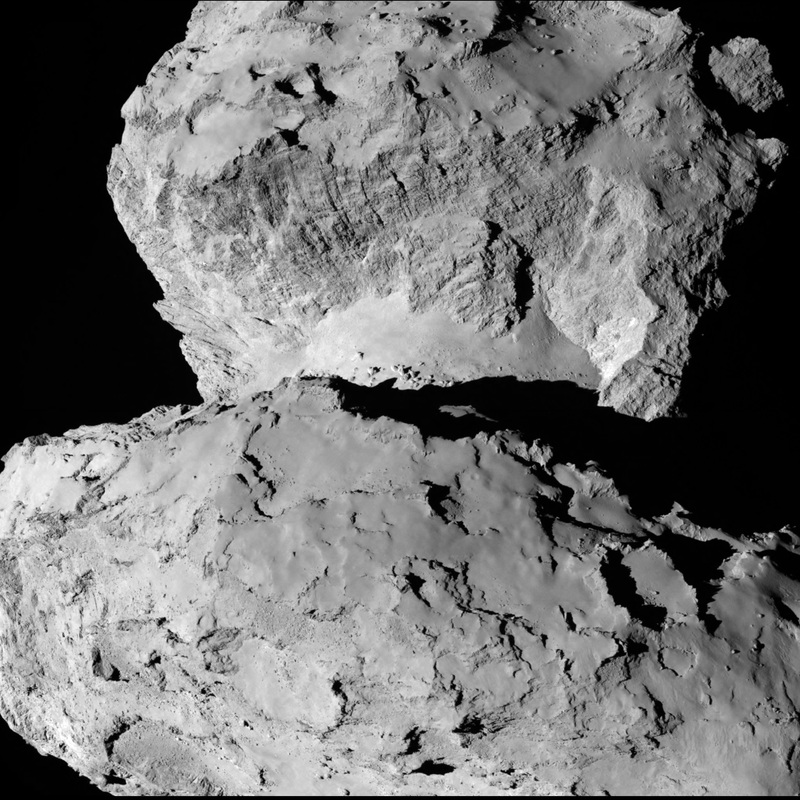 Now, another audacious and history making event is on tap – Landing on the comet! To enable a safe landing, Rosetta is moving in closer to the comet to gather higher resolution imaging and spectroscopic data. When Rosetta arrived on Aug. 6, it was initially orbiting at a distance of about 100 km (62 miles). As of today, carefully timed thruster firings have brought it to within about 80 km distance. And it will get far closer. Right now a top priority task for the science and engineering team leading Rosetta is “Finding a landing strip” for the Philae comet lander. “The challenge ahead is to map the surface and find a landing strip,” said Andrea Accomazzo, ESA Rosetta Spacecraft Operations Manager, at the Aug. 6 ESA webcast. The team responsibility for choosing the candidate sites comprises “the Landing Site Selection Group (LSSG), which comprises engineers and scientists from Philae’s Science, Operations and Navigation Centre (SONC) at CNES, the Lander Control Centre (LCC) at DLR, scientists representing the Philae Lander instruments, and supported by the ESA Rosetta team, which includes representatives from science, operations and flight dynamics,” according to an ESA statement. This week the team is intensively combing through a preliminary list of 10 potential landing sites. Over the weekend they will whittle the list down to five candidate landing sites for continued detailed analysis. ESA will announce the Top 5 landing site candidates on Monday, Aug. 25. The decision rests on the results of Rosetta’s ongoing global mapping campaign, including high resolution imaging from the OSIRIS and NAVCAM cameras and further observations from the other science instruments, especially MIRO, VIRTIS, ALICE, GIADA and ROSINA. The surface criteria for a suitable landing site include day time landing illumination, a balance between day and night to allow the solar panels to recharge the batteries, avoiding steep slopes, large boulders and deep crevasses so it doesn’t topple over. Of course the team also must consider the comet’s rotation period (12.4 hours) and axis of rotation (see animation at top). Sites near the equator offering roughly equal periods of day and night may be preferred. The selection of the primary landing site is slated for mid-October after consultation between ESA and the lander team on a “Go/No Go” decision.